I've already told you how we came to decide to build Dan a workshop. I know he's been anxious to get started on it, but with our "food first" motto, we have to tend to growing areas and planting first. April is our month to do most of that. Even so, he's got a beginning made. Here is where the workshop is going to go, where the old "coal barn" used to be. 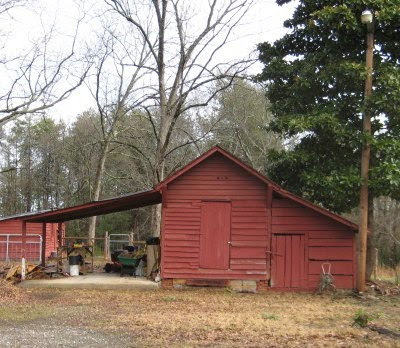 When we bought the place, there was an old outbuilding here (photo below). He used the center section for a workshop, and we used the right side for a garden storage area. We used the carport to store our homegrown hay. Eventually it started to lean a bit too far for comfort, so we had to tear it down. The workshop is going to go where the old building was, between the concrete slab and the utility pole. Just like in the photo above, he'll put another carport roof over the slab. The first step was to level the ground. His home-milled lumber is under the tarp on the concrete slab. Goat barn in the background with chicken coop beyond that. Not a very exciting blog post, I know, but that's just the beginning of the pile of photos I have to show you. Hopefully the next set will be more interesting, and you'll find it here - "Dan's Workshop: Footer or Piers?" Every project has a beginning and most aren't very photogenic. "home milled lumber"- sure sounds exciting to me! Still an interesting post. Makes us all feeling we're "in on the project!" That's so true, which is too bad because the planning and preparation stages take the most time and energy! And it's time to use it too. It's been curing for about a year and is ready to become what it was meant to be. Well, I'm glad! A lot of my posts are a personal record to document what we did and why. We often refer back to them as we need to. Hi Leigh! :)) I think it's always very interesting to read about your life and how you and Dan are moving forward with your plans. I like seeing the progress in photos too! Thanks Rain! I think the photos are the best part. Having read your book (awesome inspiration everyone, get a copy if you haven't) it's so neat to see your progress. You have worked hard and it's so worth it!!! When did you get a tractor? Ours has been the best investment in our homestead, this weekend we have been plowing in all our chicken and horse compost, to get ready to plant the vegetable garden. Looking forward to your updates on this latest project. It will be two years ago this summer. I have to agree with what a wonderful investment it is. Such a workhorse! Without it, Dan would never have been able to pull all those logs up out of the woods to the sawmill. We're also working on soil improvement via green manure. Now it's hard to imagine how we ever did without it. I love reading about beginning projects. It documents just how much work goes into anything (plus all the planning & prep which can't always be photograghed). Thanks! It is nice having a record in pictures. I think it IS an exciting blog post! Scraping way soil and preparing for a new farm building! That's great! Thanks M.K.! It's especially exciting to think of being able to finally get the yard cleaned up by finding a home for everything!